What is it about cinnamon rolls? In fact, what is it about pecan cinnamon rolls in particular? They are classic comfort food when done right but so much of the time we eat them half stale, purchased from a market. They do take a couple of hours to make but they are so delicious they are worth every minute. Yes, they are super high in calories and fat and carbs but you’re not supposed to eat them every day. Save them for special times. I almost hated to give the nutritional information because I figure that it will scare some of you off. 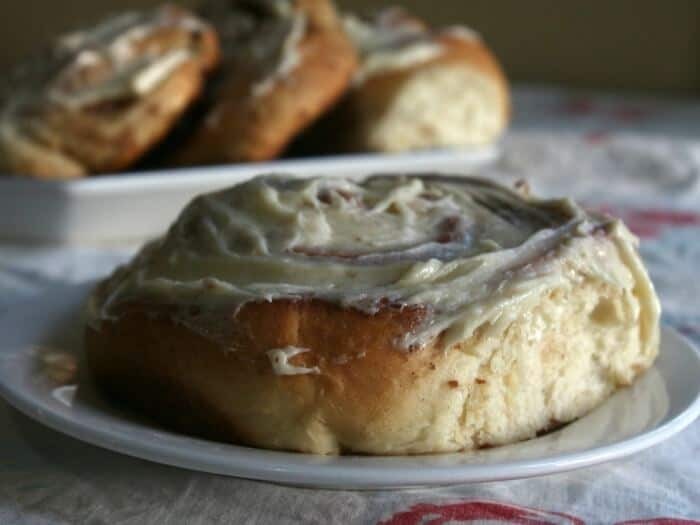 Make them at least once – you’ll never want any other kind of cinnamon roll again. The dough is rich and just sweet enough, buttery and soft. It’s rolled around a thick, spicy filling of cinnamon, brown sugar, and pecans. 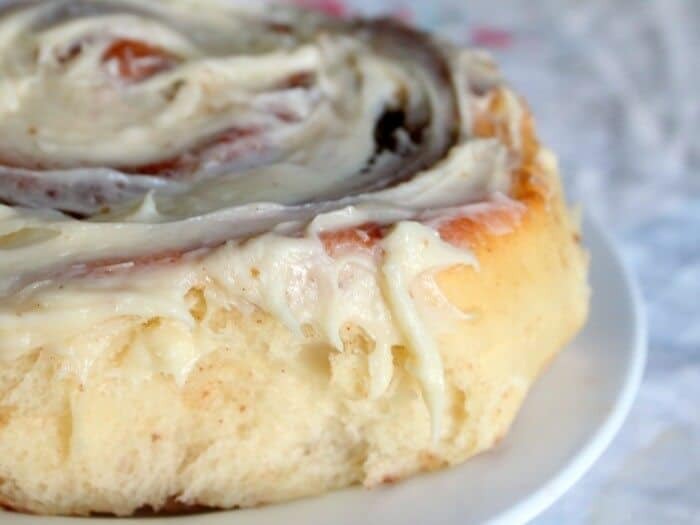 Once they are baked and have a chance to cool a little you add the creamiest, tangy – sweet, gooey copycat Cinnabon icing you’ll ever put in your mouth. Add it thick. In fact, you might want to double the icing recipe. I have so many recipes for cinnamon rolls but this is my favorite. It always makes people’s eyes light up, the aroma in the kitchen is amazing, and I happen to think they are the best I have tasted. Try them for yourself. By the way… that is a large salad plate in the picture. These are huge. You can make them smaller and get 24 out of the recipe but somehow they are not as good that way. Vanilla salt is a flaked sea salt with vanilla beans in it to give it a vanilla flavor. It is not essential but it does make a difference. The recipe includes links so you can find it easily. If you click on them and buy it I get a small commission which helps to support the blog and it doesn’t cost you extra. So, thanks for helping keep Restless Chipotle up and running! Huge cinnamon rolls, stuffed with pecans and cinnamon sugar. Once they are baked to a golden brown you slather them with a rich,tangy cream cheese icing that is not too sweet - just right. These are not for everyday but special, once in awhile breakfasts and brunches! Combine the yeast 1 teaspoon of the sugar and the water in the bowl of a stand mixer or Bosch and set aside for about 5 minutes. Combine the sugar, milk, butter, and vanilla. Beat the eggs and add to the milk mixture. Mix the salt and gluten with four cups of the flour. Add the milk mixture to the yeast and mix on low for just a few seconds. With the paddle attachment in place begin to add the flour and gluten mixture, beating on medium speed. Add as much of the remaining flour as you need to make a soft dough. Knead for about 7 minutes on medium speed. Turn the dough out and knead briefly. It should feel like your earlobe if you pinch it. Grease a bowl, add the ball of dough, and grease the top. Cover and put in a warm place for about an hour, or until doubled (or more) in size. Gently deflate dough and roll into a 12-inch by 24-inch rectangle. Mix the brown sugar, cinnamon, and salt. Sprinkle with a thick layer of cinnamon and sugar mixture. Add the pecans and gently press them down. Do not mash them into the dough! Cut into 12 cinnamon rolls. Let rise for about 40 minutes until doubled in size. Bake at 350F for 15 minutes, or until done. Remove from oven and let cool for about 10 minutes at least. Add the cream cheese, butter, lemon juice and vanilla to the bowl of your mixer. Beat on high until the mixture looks well blended. Turn mixer to low and slowly add the powdered sugar until the icing is soft and spreadable. Add a thick layer to the cinnamon rolls. For me, Cinnamon rolls always conjure up Saturday morning trips to the mall. They are very special treat for me and your recipe is beyond amazing. Those cinnamon rolls are sure to put a smile on anyone’s face. 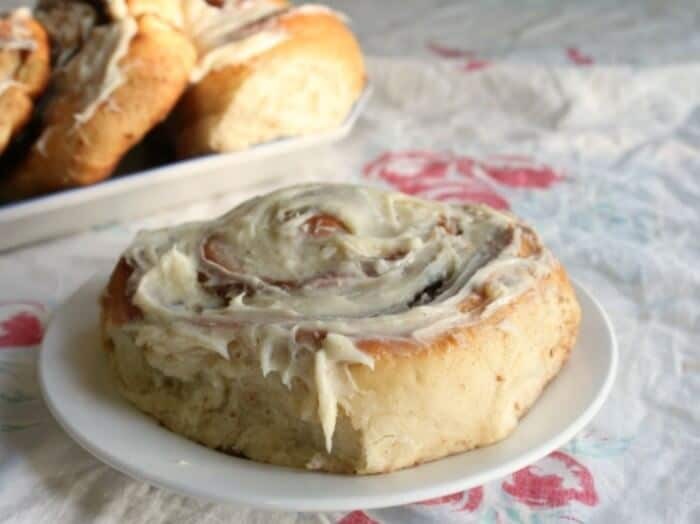 I love really big sweet rolls like those, especially with thick frosting on top. These rolls look sooo delicious! I want to make these the next time I host brunch. Oh mercy…. I was just craving something along these lines today! Heaven help me but I need this now! Well, do what I do and make 2 batches. Eat one without telling anyone… then “share” the other. 🙂 problem solved. These are the kinds of cinnamon rolls my father in law just absolutely loved. Could never find them like this. Thanks for this recipe. I know the boys in my house will love these. Right? They really are good for the holidays! These look divine, I’ll take two! I want these on Christmas morning. The look like the perfect holiday breakfast to me. Yum! Oh my yum!!!!! These are my kind of cinnamon rolls! I don’t think they could be more perfect! These cinnamon rolls look crazy good!! Yep they are…I love gooey cinnamon rolls! I just recently made some Cinnabon Cloned Cinnamon Rolls, but you’ve beat me here on size. My kids would love one of their own THIS big. I’ll have to try this recipe next time I make some! I’m drooling over these! They look incredible and like a perfect treat after the first few days of school!